We let Caleb cry for 12 minutes last night. And at some points, he was really losing it. At other points, it was more of a whimper…but we let him cry. If you asked us seven and a half months ago if we would let Caleb “cry it out” – we would have said no. There was that article getting linked all over Facebook, at around that time, about how they found that babies who cried it out, actually lost some brain cells, or something like that. And all of the attachment-parenting folks let up a communal “BOO-YAH!!! !”, for they knew they had been doing it right all along. But…parenting is hard. And getting babies to sleep is hard. Caleb, of course – like all babies, has gone through cycles. There were some weeks where he’d sleep through the night. Other weeks, where he’d wake up occasionally, and we’d give him a bottle to go back to sleep…we tried different things, but most recently, it was taking a bottle (or two) to get him to go to sleep in our arms…and then of course came the…transfer…from our arms to the crib. And if you didn’t do it just right, you’d have to start the process all over again…to say that it took a long time or was trying on one’s patience is an understatement. And then there were the naps…or, the non-naps…or the attempts at naps, which would sometimes last 30 min. There aren’t many things more frustrating than working for 30-45 minutes to get your baby to go down for a nap, only to have them sleep for only about 30 minutes. Sarah is at home with Caleb for the majority of the time all week, and it’s incredibly trying and tiring for her to deal with a baby that doesn’t nap. About 2 weeks ago, we moved back to the swing for naps…and we occasionally had luck with that, and our babysitters generally had better luck with them. But he is going to hit the weight limit for the week any day now, and we knew that we were using that as a bit of a crutch. So, before we left for vacation, I moved the swing out into the garage, and Sarah started reading “Solve Your Child’s Sleep Problems” by Richard Ferber. Two nights ago, after leaving the hotel in Atlanta and arriving at the condo in Hilton Head, we decided to start using Ferber’s method for naps & bedtime. So she got him ready for his morning nap, put him in the crib awake, and just walked out of the room. We waited 3 minutes, and then she went back in to comfort him, then left. The crying continued. We waited 5 minutes, and then she went back in to comfort him. The crying got softer…and then it stopped. Just like that. And he took a 1.5 hour nap. We couldn’t believe it. So we tried it again in the afternoon. Same times in between going back in to comfort him…and he slept for 1.5 hours. We tried it again at bedtime. I got him ready, read him “Goodnight Moon,” gave him a bottle, and then put him in the crib awake. I had to go in twice (like earlier in the day) to comfort him, and his crying did get pretty loud. But after about 12 minutes, it stopped. Just like that. I went in to check on him and he was asleep. Dead asleep. And he slept from about 8pm until 7:30am. We’ve had equal amounts of success today with his naps, and we just put him down about 45 minutes ago for bedtime. He cried for about 3 minutes and then stopped. And now he’s asleep. Now – we might chalk this up to beginner’s luck, or it could be that he’s just screwing with us…or it might be that at about 7.5 months old, he was ready for this sleeping technique. I’m probably not going to become a die-hard “crying it out” advocate, and I certainly won’t tell anyone else what to do, but for us and Caleb, for this stage of his development, for the sanity of his mom and dad, for allowing him to get the sleep that he needs at this age, and for making everyone’s lives a little bit easier…this is working for us right now. And I have to say – it’s pretty amazing to hear him crying for a few minutes, and then to just stop. To put himself to sleep. And to know that he wakes up happy, excited to see us, and doesn’t seem to be too worse for the wear. Now I’ll admit, there is a part of me that feels kind of bad coming into the room with a screaming baby, looking down at him, patting him, comforting him, and then saying “I love you buddy” and walking out while his screaming continues. But…at least in the past 2 days of trying the crying it out method…his crying really doesn’t last long, and he quiets down, goes to sleep, and enjoys long and regular naps, and a great sleep at night. I think part of parenting is doing the things you wouldn’t think you’d do. Or the things you swore you’d never do. And I don’t think that’s a bad thing. I think that crying it out makes sense for some people. And I think attachment parenting makes sense for others. And both can work for some people at different times in their lives and their baby’s life. We also started putting Caleb directly in front of the TV at points today to get him to chill out…and he is mesmerized. Now – that’s for another post – but it just goes to show that you never know what you’ll do sometimes as a parent. Would Sarah and I have said that we were going to let Caleb cry it out, or that we’d be putting him in front of the television to give ourselves some peace and additional sanity? Probably not. But it’s working for us now. And I think it will help us enjoy our time with him even more, and allow us to be better parents in some ways. What things have you done, or are you doing, with your children, that you swore you’d never do? How do you feel about that? Is it working for you? Update #1: We’ve continued to use this method the past few nights and it’s working well. The naps are going okay (except for the 24 minute nap he just took….fail), but he’s been sleeping really well at night and last night, he woke up a couple times but put himself back to sleep. And reading more about the method in Ferber’s book, it’s actually called the “Progressive Waiting Method” – and not the crying it out method. Oh no! 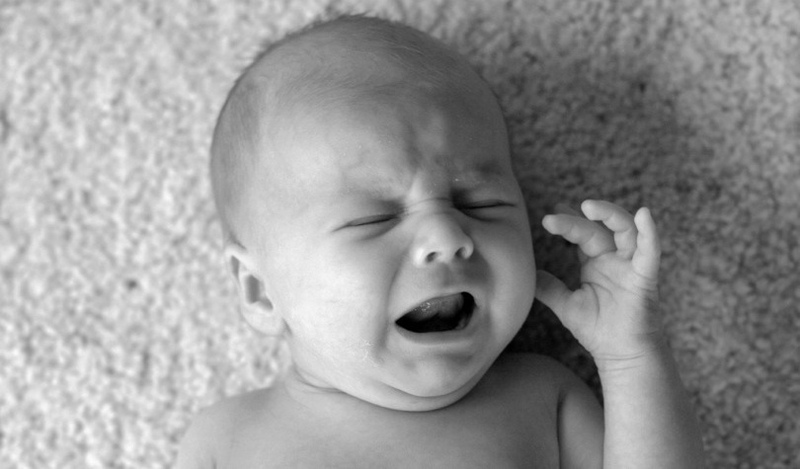 Cry It Out is shown in studies to have brain damaging effects on babies. I wish you had researched other baby sleep techniques a lot more before using such a drastic, and destructive ‘technique’. I also I tried CIO with our first baby, and have regretted it ever since, it’s just not a natural, normal or healthy parental response to a crying baby. Cherie, everyone can make their own decisions about cry it out and parenting their own children. There are numerous articles about why co-sleeping or rushing to your child’s side every time they cry can be destructive as well. Good for you to do the cry it out method! We did it too with our first born and he is the BEST sleeper ever now. We also plan on doing it soon with our second born. I’m a HUGE believer in it. Children need to learn how to sleep on their own and I think you and your wife did a great job! And as for the people that say they are losing brain cells for crying – that’s just crazy – there’s plenty of studies out there too that will show the cry it out method has no negative impact on a child whatsoever. And what’s a few days of a little crying in the long run?? I would rather a few days of crying then having a kid that wakes up multiple times a night even when they are a few years old! For all of you who say babies that cry have brain damage and altere personalities etc. you fall into the same category of people that say breastfeedibg is the best and only way for babies. To address the first, I have had two babies with extreme colic who cried basically all day everyday from the time they were about 2-3 wks to 3months. Nothing we did helped, we read every book under the sun. And guess what, after colic both are extremely bright and kind. Are you to tell me though that my kids are now at a disadvantage just because their beginning was different than a non-colicky newborn? A little crying in CIO is no more than colic babies. They will be fine. Second, I know breast feeding is best blah blah but some women can’t breastfeed, for whatever reason. To tell a mom who formula feeds all the reasons they should’ve breast fed is not only arrogant but incompassonate. This is the same thing. This family did what they felt was best so they could be the best parents they could be which sometimes just can’t happen when ur sleep deprived and frustrated, go figure. Leave all ur studies show comments to yourself and just know that different things work for different people. If u don’t like it, do it different with your kids. Ferber method! Ah, brings back memories… Sleep is definitely the hardest issue with babies (unless they have eating issues, I hear – we never had any of those) but I think you two are doing a great job. You’re on to something here – parenting is all about what works for YOU and for YOUR child, and it obviously changes over time, with different kids, etc. All of that said, there are many things that we have done that I didn’t picture us doing (or saying!) but overall if you continue to hold to what you value and constantly having that in mind, you’re all good. Good for you all – for trusting your instincts and doing what’s best for not only Caleb, but for you and Sarah. It’s so hard. One thing parenthood has taught me is that I just have no room to judge other parents’ parenting styles. And most of the time it’s more about survival and not so much upholding some philosophy or ideal. Awesome that he’s sleeping better, I’m so glad! We had a similar experience with Sam and were amazed at how much more rested he seemed when he was able to put himself to sleep. I’m leery of any rigid rules when it comes to parenting. We lived by the book Healthy Sleep Habits, Happy Child which has stage by stage advice for babies including average needs of sleep at various ages. It also has troubleshooting suggestions for exhausted parents. Best parenting book we own hands down. The Ferber method worked wonders for us. We have exposed Ella to educational television since she was 6 months old and she now knows all her ABC’s, counts to 20 and has many of the early building blocks to reading down. Some parents would say we are lazy parents, but when you have two parents who work and go to school full time, you need YOUR sanity. You and Sarah are doing an amazing job with Caleb. Remember you need to find what works for YOU, he is YOUR child. What until you have to start disciplining… Ugh! I think as long as you don’t leave a baby crying for hours on end, it’s fine. 12 minutes of crying isn’t going to do him any harm. If this method is working right now for you, great. I’ve found with my girl, things change over time. What worked one month won’t work the next, but when you find something that IS working, go with it! CIO in small spurts is sometimes your only option (I once got kicked out of a crunchy mom Facebook group for saying that!) but anything over 15 minutes,IMO, is too long. I loved the Sleep Lady method and the No Cry Sleep solution, I took tips from both and then did what worked for us! I have a toddler and he goes to bed just fine now but he was a terrible sleeper for the first year. Some kids are just that way, I just tried to remember that it wouldn’t last forever. In fact, most nights I still want to rock him to sleep and he asks to get into his bed! 🙂 Parenting is hard work! Kids are resiliant. My girl is proof. Babies cry. It’s okay for them to cry sometimes. Our baby girl is 15 months old and has been a great sleeper since we finally let her cry a bit. A few tears for months and months of healthy sleep habits = A valid and worthwhile tradeoff for all parties involved. I am in the process of starting a version of the Ferber method for my son for naptimes and for his first nap today it took 10 minutes of crying (I checked on him every 2 min though) before he fell asleep, which was much better than the 20+ min of me tying to rock him and soothe him to sleep. And I have to add that even when I am trying to rock him and soothe him to sleep he is crying the whole time… So let him cry for 20+ min in my arms or 10 min in his crib? I think we all know what makes more sense. Don’t let people tell you CIO has been linked to brain damage. I guarantee those people haven’t actually read the study, which IS linked to brain damage caused by crying…if you let the baby cry for hours on end, night after night (the kind of crying that really IS tantamount of child abuse). We did the Ferber method first, and the checks just upset our daughter more, so we did Weissbluth, and within a week, we had a baby that dropped all nightwakings and only woke up for her scheduled feedings. Now she sometimes sleeps through the night or just has one feeding. It was what was needed for us, for the same reasons you described above. I was so exhausted I could barely parent during the day, let alone at night, which was not a healthy situation for me or my child. I am glad sleep training worked so well for you! We are in the exact same situation ourselves. We tried Ferber but our little guy gets more worked up and stimulated if we go into him, so basically we are doing Weissbluth’s extinction (and this is after I SWORE to NEVER let him cry it out). It seems to work faster in the long run and therefore there is less crying overall. We found that all the techniques we had used to soothe him (i.e. rocking/boncing/shushing/pacifier) just weren’t working anymore. That’s when I realized 2 things: 1) He clearly wanted to LEARN to do it by himself because he would reject my help and 2) I realized that crying was him expressing his frustration at not being able to do it just yet. He was the same way with tummy time. He would scream his head off and just lay there kicking and flailing and squirming. I used to pick him up immediately because I thought he was in pain, but then realized he wasn’t learning to pick his head up and decided he’d have to work it out on his own. And guess what? After 2 weeks of letting him scream during tummy time, he started lifting his head up and a couple days later he rolled right over! He’s getting much better with sleeping. Still cries during naps and at night but he is also teething so we take that into account. We do everything possible to reduce his discomfort and to show him as much love and affection when he is awake. He’s gone from screaming his head off for hours to on and off fussing while trying to put himself back to sleep. And too those people who say babies will just stop crying once you stop responding, that is such bologna! When my baby wakes up hungry, he WILL let you know! He also smiles and me all day and loves when I tickle him and give him kisses, so I don’t think he’s THAT traumatized. I like that you’ve related this to your experience with Tummy Time, it makes sense to me that way. I am currently trying the Ferber Method with my baby girl, and it’s so hard to listen to her cry! At night it takes less than ten minutes of crying now (after only three days, down from 20 minutes!) and today I did it with her for the first time for nap time. It took just under 30 minutes (I checked on her every 5 minutes or so)… then she finally fell asleep. I hope that tomorrow’s nap time is easier for her. Slow and steady. Lots of patience. She even seems better rested in the morning now. I really wish our kid would fall asleep after 10 or 20 minutes of crying. Her naps this afternoon FELT like child abuse, although since she never really did get to sleep, at least she is sleeping at night (after only a few exhausted minutes of crying). It’s our first day of Ferbering, and it’s possibly the worst day of parenthood so far. But we can’t keep up this whole thing where we have to keep popping a pacifier back in her mouth every few minutes all night long. Andrea, I’m sorry it isn’t working so smoothly yet…I’d just encourage you to stick with it. Our son regresses from time to time and we have to start over and it hasn’t always gone as well as that first blog post I wrote. I am going to try this for my sons naps! Like most of you, it takes me 10-40 min of rocking to have him sleep for maybe 40 min. Today I tried the rocking, I put him down drowsy and went back in every 5 min. I don’t want to speak too soon, but I haven’t been in there in 30 min! maybe this is a start of something great!!!! I am hopeful! Thanks for posting this, it’s exactly what I needed right at this moment. I’m curious on how this worked out for you. My son (5 months) sleeps not to bad at night but his naps are terrible. 30 minuted sometimes longer, but never more then an hr, and the hr is very, very occasional. I find when I put him down drowsy, as soon as you set him down he’s wide awake. He will literally lay there until his next feeding. (not crying sometimes a bit) (ive only tried this a couple times as I feel like I’m neglecting him). Any pointers? Want him to fall asleep on his own at nap times too but he seems to resist. I feel like rocking him and getting 30 min is better then no sleep at all…..ugh not sure what to do. I swear I could have written this myself. My son is 8.5 months old and I was at the end of my sanity!! Being at home with my son all say with no naps and if he did nap it was on me is the hardest thing I’ve ever done. I said I’d never do it but here I am! My son is just over 6 months (but is closer to 3.5 months developmentally since be was born 10 weeks early. I was exhausted, my house has been a mess, and it is hard to make any plans because my son has only napped for longer than 30 mins when he is sleeping on me. He generally does well at night. I too said I wouldn’t let him cry it out, but it was time to try today. His first nap started good I thought with just the occasional whimper for the first 20 minutes. Then it got worse. When he started screaming I went in after 3 minutes, then 5, then 10 each time after that. It took 40 minutes of him crying on and off before he finally fell asleep…and plenty of tears on my part. He only slept 50 minutes. This time (his second nap) he was asleep in 15 minutes! What a relief! I will try this method for a few days before I try something else, but so far I feel like the change is for the better. Okay time to go wash some dishes before he wakes up! I think that we need to do what we think is best as long as it is safe. Wise words…Parenting: Doing Things You Wouldn’t Think You’d Do. Thank you for not making me feel like the worst parent on the planet. Of course nobody has a child hoping to let him/her cry it out. This is something I didn’t expect to do, also! I feel like my husband and I have an extreme baby… we would often try for hours to get her down for even 10 minutes of sleep for naps. Seriously. But we tried CIO for the first time at 7 months when I read “Bringing Up Bebe” and decided that the co-sleeping we were doing was no longer good for either of us. Our daughter’s light sleeping ended once we started our new method. She would cry for less than 10 minutes and then suddenly just stop (like described above). For the first time, she was sleeping through the night and taking regular, deep naps during the day. We both are doing better than ever during our days because we’re finally getting good sleep. The extra nurturing I thought I was doing was actually worse for my daughter than a little tough love. When my son turned 7 months, we used Ferber and he got 12 hours straight by the 3rd night. Then he got a cold, then his big brother (who shares a room) got a double ear infection, then the baby cut 3 teeth. Now here we are at 10 months starting all over… and it’s going MUCH worse. He’s so much older and stronger and independent and stubborn! Did your little one regress? Was it harder as he got older? Naps are a nightmare, but he’s doing better at night. I’m supposed to lie him down “drowsy but awake” but he usually starts to slip away while nursing and when I pop him off to transfer him “awake” to the crib, he just goes all Incredible Hulk on me. Any tips? I just did my first CIO for her nap today. To pass the time inbetween consoling her I’ve been reading up on CIO and ran across your site. You probably hear this often but it’s nice to have imput from the daddy’s perspective 🙂 My husband is much more involved the second child around than he was the first so it’s nice to know there are full time dads out there. Back to the discussion at hand…I tried a gentler version if CIO with our second child seeing CIO did NOT work with our first. My first child would work herself up so bad she would throw up and that was so counter productive. Moving onto child #2…..as I mentioned above I tried a gentler version the past couple week and it hasn’t been successful. Today I just got fed up with fighting with her to sleep for her first nap. She was up at 5:45am this morn after sleeping on me for three hrs and by 8:45am I had it and just put her in her crib to CIO. She was quite persistent but so am I today. It took exactly one hr for her to fall asleep for her nap. She fell asleep at 9:45am and at this moment it is 10:30am….fingers crossed we get atleast an hr and a half nap. So tonight we will do CIO for bed. My husband is on board and just before her CIO nap I got my eight yr old on board also. Wish me luck and good luck to everyone in their CIO pursuit. I would like to add that there is definitely a difference between “CIO” and the Ferber method. For anyone considering using this approach, PLEASE read the entire book BEFORE you try it! He explains so much about how babies sleep, what specific issues are causing sleep problems, etc., etc. Some may think that they understand the idea of CIO but then it doesn’t work – but they are probably not following the approach the right way. For example, if your baby is sleeping a total of 12 h at night and only needs 13-14 TOTAL hours of sleep per day, don’t expect him to take two 2-h naps (a total of 16 h). Also, Dr. Ferber is very specific with his progressive-waiting technique – very important that the times you go in to check on baby slowly increase the time between checks. He also says that if you are trying the technique for naps, you’re supposed to “give up” after 30 min and then try again during their next scheduled nap. So there is never any long period of time of crying. Overall I think the Ferber method is very humane. Although it was very tough to hear my daughter cry, going in to check on her periodically reassured me (and her) that she wasn’t being abandoned. It helped her go from waking 6-8 times per night to maybe once (and sleeping 11 h total) in about 4-5 days. Yes, colds, traveling, etc., may require you do do the progressive waiting again, but it is NOT as bad as the first week! The only thing the Ferber method didn’t really help with is naps. She goes to sleep just fine for her naps and will sleep 1 1/2 h if you hold her, BUT she wakes up after only 15-40 min if she’s in her crib. At that point she’s no longer tired, so the Ferber method doesn’t really work… she just gets more worked up. I think Ferber method is a lot easier for nighttime because the pull to sleep is much stronger. I did try the Ferber method for naps when she was 6 months old, and she’s now almost 9 months old, so maybe we’ll give it another shot. Did anyone have luck with Ferber helping a baby that takes short naps? I have done the CIO method for two days now with my 2 year old, and at night it works just fine, after the first time checking on him after five minutes, he fell asleep 10 minutes later, but the nap time is a disaster. He will cry non stop, get up, open the door, disconnect the baby phone and so on, this of course causes me to react and go in, which defeats the purpose of the CIO method completely. Help! Won’t the disasters during nap time limit my progress at night? Great post! For anyone on the fence about giving sleep training of any kind a try, please consider reading the book ‘Bedtiming: The Parent’s Guide to Getting Your Child to Sleep at Just the Right Age’ by Isabela Granic. The book addresses different stages of development in children and provides guidance for the best developmental timing for using *any* sleep training method. With my first son, our (then) pediatrician told us we should have our baby CIO at 8 weeks old. As first time (exhausted and heading back to work) parents, we did what we were told- and have regretted it ever since. We lasted exactly one night, then promptly found a new pediatrician. Our new pediatrician told us that our mistake wasn’t necessarily that we used CIO, it was *when*, as in, the age of our child, that was our mistake. Seems obvious now, but we didn’t know better at the time. Our pediatrician recommended Granic’s book, and it was a godsend! We did CIO again when our son was 6 months old (one of the best times to try sleep training developmentally according to Granic), and he never cried for more than 10 minutes, and the ‘training’ lasted 2 nights. After that, we’d put him down wide awake and he’d chatter to himself a bit before drifting off to sleep- for the entire night- and he’s been a great sleeper ever since (he’s now 2 1/2 years old)! My second son is only 3 months old, so we will just hang in there until the developmental window for sleep training opens and trust that it will play out similarly. I know this is an old post, but it spoke to me because when we first had our little one I would never in a million years thought we would use any facet of a crying it out method. In the end though, when he gets overtired and he just isn’t responding to rocking, singing etc, I just let him get on with it. There are definitely disadvantages to Ferberisation, and there may even be some possible physiological risks, I don’t know. But I’m 100 percent sure that for a tired baby to be unable to sleep for hours is harmful. And being as I know if he cries for 10-20 mins he will go to sleep, then when necessary, that’s the route I’m going to pick rather than an endless, fruitless cycle of rocking and screaming. This has made me feel soooo much better! My second is seven weeks old with an extreme case of acid reflux so the regular techniques to get him to sleep won’t work since any movement within an hour after eating will make it come back up and hurt him. The only thing that seems to help his throwing up is laying him on his stomach…and of course he cries! he wants to be held and I want to hold him but I want him to grow properly even more so I have been just watching from where he can’t see me so I know if he gets sick but he will go to sleep in just a few min vs. the struggle of throwing up, bath, another bottle, soothing and repeat. Thank you!